see the white stuff aroun his mouth.. 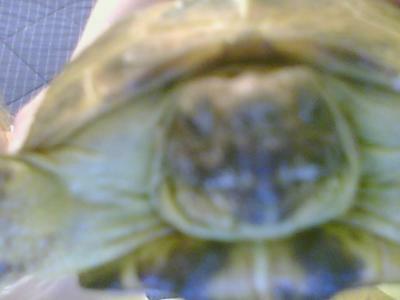 I have a russian tortoise. He has white stuff on his mouth and he goes in his bath water all the time. I feed him daily, about a hand full of letuce everyday, is that enough? I let him out almost evey other day, granted it has been cold where i live so he doesn't really get to play much. I keep his tank at about 75-80 degrees during the day but at night i turn off his light and it gets about 60. My tortoise hasn't come out of its hiding are and it won't eat it also peed/pooped white and it was very thick is my tortoise sick??? My Russian tortoise poop/pee white and it was I'm pretty sure it's a female is it sick? The white stuff you see you defiantly should take him/her to the vet. Don't give it a bath once a week give it to him like every other week. Feed it healthy with fruits and vegetables defiantly lettuce my tortoise likes spring mix. Always wash everything before you give it to them.make sure the food is nontoxic and poisoned ok well take care of that tortoise mines a Russian. A tortoise eliminates a white liquid similar to that of birds. It is nothing to be concerned about. I put her to walk around the kitchen went I pick her up I noticed she left a white, mocusse and the floor. Well if your tortoise is at a young age [3years] wash it just two times a week as it can cause skin problems. The white around the mouth would warrant a visit from the vet. A diet of only lettuce is not good for any tortoise. A Russian tortoise should be eating fleshy vegetables,a little fruit and some flowers. It will eat nasturtiums happily. Be sure there are no poisons on anything you feed your pet. They recommend feeding your tortoise as much as he can eat in 20 minutes each day or in an hour every other day. They also say that your tortoise needs a warm spot under the light that is 90-95 degrees and a cool spot that is 70-75 degrees during the day. It's OK for the temperature to be in the 60s overnight. Also, peeing and pooping in their bath is normal for tortoises. Being in water stimulates them to do that. As for the white stuff on his mouth, I would recommend that you take him to a vet.